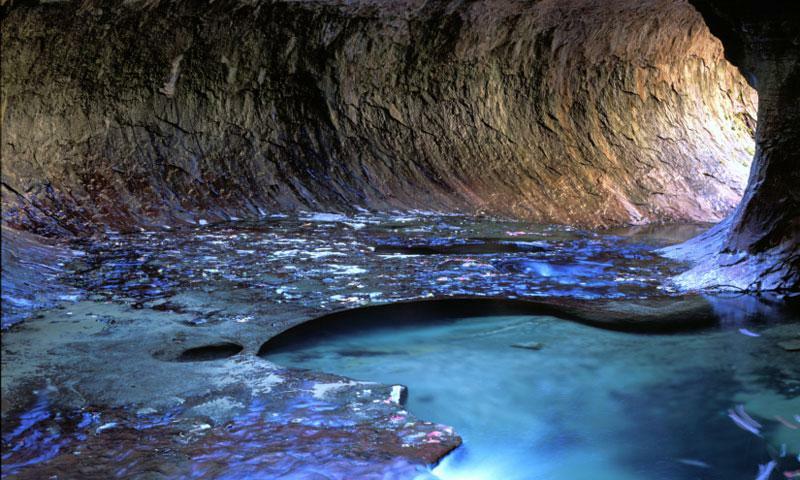 The Zion Subway is an incredible canyoneering route through a multi-colored slot canyon filled with wondrous waterfalls, a chiseled tunnel, cold pools, and mossy rocks like satin, not to mention dinosaur tracks! Apply to the permit lottery at least three months ahead of time. One of the most popular backcountry trips at Zion National Park, Subway is a six to eight hour canyoneering route that follows the Left Fork of the North Creek, starting at the Wildcat Canyon Trailhead, and following the river until the Left Fork Trailhead. The trail passes through a set of incredible waterfalls, pools and erosion-carved sections that, simply put, look like a subway tunnel. The rocks vary from red, orange and black, and then all the way back to the classic sandstone beige. There are even dinosaur tracks towards the end, adding a history lesson to this incredible trek. 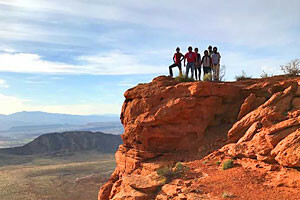 The trail starts at the Wildcat Canyon Trailhead and ends at the Left Fork Trailhead. Both trailheads are located along Kolob Terrace Road. To get there from Springdale, head west for 14 miles on route 9 until the town of Virgin. The Left Fork Trailhead is 8.6 miles north on Kolob Terrace Road, and the start at Wildcat Canyon Trailhead is another 7 miles up the road. Average Time of Hike - 6 to 8 hours. In order to regulate the environmental impact in The Subway, Zion National Park has set a maximum of 80 people per day, meaning permits are difficult to come by. 25% of the permits are reserved for walkups, and the remaining permits are given out in a lottery fashion, three months ahead of the requested date. 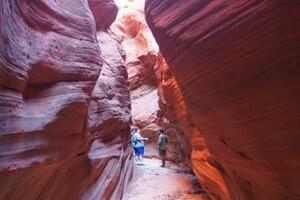 This is a technical canyoneering route, with little to no escape route. Be sure that you can ascend a fixed rope, stop mid-rappel to fix an issue, as well as help another person who is in a difficult position. It is recommended to travel in groups with some experienced members. With a rating of 3B III, the route is not considered particularly technical, which makes it a great place to start if you're just breaking into this amazing sport. However, as with any canyoneering route, there is a set of required skills and a certain degree of risk. To apply for your permit, contact the park office, or visit http://zionpermits.nps.gov/. While the primary draw of this trail is going from start to end, visitors who want to see part of The Subway can do so from the Left Fork Trailhead, walking up the trail until reaching the river. Hikers are permitted to wander upstream as far as they can safely hike.